A replica Sputnik 1 satellite (1957), Science Museum exhibition, 1987. The first transatlantic TV picture from space, 1962. Telstar solar cells, c 1980s. Launch of satellite SBS-3 from the Space Shuttle, 1982. Astronauts aboard Shuttle Discovery, 1985. 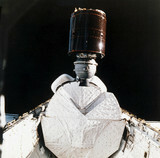 Landsat D satellite before launch, 1982. The Landsat D satellite before launch, 1982.